How does the PhotoShield cover work? 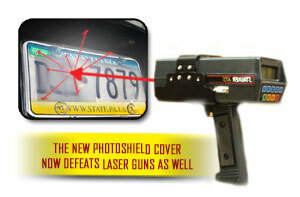 The special formula PhotoShield cover incorporates a thin diffusional lens designed to protect you from unjust tickets issues by photo-radar and red-light overhead cameras! Our design is effective, inconspicuous, and successful against most types of traffic cameras. Cover diffuse incoming laser beams. One can covers 4 license plates for a lifetime of protection! Screw license plate back on to car with PhotoShield Cover on top. Notice how subtle the distortion is? See how the numbers contort? Almost all the numbers and letters are illegible at different angles. Use the two products together! We strongly recommend using the spray blocker and photo-shield cover together. The spray blocker will work best with flash cameras and the photo-shield cover work with side angle and above mounted cameras. Some state & local law enforcement may ban devices, which obscures license plates. Buyer is responsible to know laws pertaining to the protector use.